Liz and I installed a grid connect solar power system from Solar Charge P/L for our new environmentally friendly house almost four years ago. We have been delighted with our solar power for homes. It does what Solar Charge promised. Our usage bills on the house are almost zero over the year and we look forward to the Victorian feed-in-tariff giving us more credits in the future. It was comforting to work with a company that has been in the solar industry for so long. Our experience with Solar Charge has been more than satisfying. They have proven to be highly competent, prompt and ethical. The most important thing is that we received the correct advice and this resulted in the optimum installation for our needs. We have a 1kW system and I am pleasantly surprised how much of our power needs it supplies in summer. Our Sunny Beam device also allows us to monitor the power generated from inside the house helping us to maximise the benefits of the panels. I would recommend Solar Charge highly. 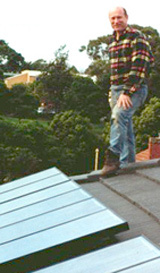 I write to thank you sincerely for the excellent job that your installation team of Darren and colleague did with the Solar Panels on our roof in Keysborough in January 2009. They were efficient, courteous and most professional in their conduct. As promised, they arrived at 9.00am and worked through until the job was finished late in the afternoon. There was not a scrap of cardboard, foam or wire lying around the backyard when they completed the job. I cannot speak more highly of the professional way which they conducted themselves and represented Solar Charge on this occasion. Please feel free to use this letter as an endorsement of your reputable company and the excellent work carried out by Darren and his young assistant. "I was keen to put a grid interactive solar system into my new house and got together with the team from Solar Charge to work it out. To me solar power for homes is the way of the future. This system is for the sake of our Planet, we cannot burn fossil fuel forever." Why did we buy our solar system from Solar Charge for our new home? Before buying any equipment of importance we investigated all aspects very carefully. In doing this we contacted many solar energy equipment sales companies. Solar Charge was recommended to us by a friend. We found Solar Charge by far the most knowledgeable and with a sense of practicality which only comes with personal experience of using solar equipment, which they do. As this was a new experience for us, we were comforted by the expertise, interest and flexibility of Solar Charge. 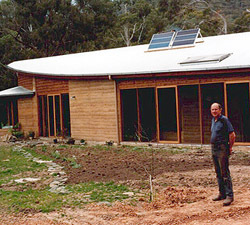 It was also a load off our minds to have the equipment installed by Solar Charge and working when we moved into our new rammed earth house. Not only was the system working, but a complete wiring diagram was sent of our installation by Richard Potter of Solar Charge which any electrician can follow. We are thrilled with Solar Charge. After eight years living exclusively with solar power, we are happy to say that the installed system and on going service given by Richard Potter of Solar Charge has been terrific. New improved equipment was made known to us and installed as appropriate. The new installed monitoring equipment has simplified our system maintenance, and added some visitor interest by running the tests. It�s hard to imagine why you need the grid. Channel 7 / Seven Network is committed to reducing our carbon emissions. One of our recent initiatives has seen us install the first of what we hope will be a series of Grid Connected Solar panel installations. We chose Melbourne based Solar Charge due to their long established reputation and quick response to our call. They delivered as promised. Copyright ©2008 - 2019 Solar Charge, Melbourne. All Rights Reserved.